Owners are facing increasing hurdles refinancing their homes because of falling property values, stringent definitions in what constitutes income and demanding paperwork. Owners seeking refinancing have also to deal with smaller loan quantum as a result of conservative property valuations. More home owners are also opting to switch from floating to fixed rates due to rising interest rates, or re-price to lower rates anticipating the Sibor (Singapore interbank offered rate) to spike further. Banks are not disclosing numbers, but said the percentage of customers unable to refinance is insignificant. According to an independent mortgage adviser, about 25 out of 300 cases it advised in the last six months could not refinance due to their inability to meet either the bank's credit assessment criteria or the total debt servicing ratio (TDSR). Refinancing may not work for everyone. Incurring additional fees or shorter loan tenure with higher monthly repayments may just put some owners off. Since the TDSR framework kicked in, refinancing has become a headache for many, even with the three-year grace period for mandatory compliance until June 30, 2017. For example, those who had funded their property with the help of a guarantor in the past are also now required to remove the guarantor as a mortgagor. Loans with tenures based on the younger applicant's age will become subject to income-weighted age computation. The inclusion of other purchases such as commercial properties also affects loan limits, especially the stricter 30% mortgage servicing ratio which applies to owners of HDB flats and executive condominiums. Meanwhile, not every bank has adopted in entirety the list of financial assets suggested by the Monetary Authority of Singapore (MAS). Some banks do not recognize stocks deposited with the Central Depository, others do not accept stocks held with foreign exchanges, yet others do not accept cash held jointly with a third-party non-mortgagor. You get the picture. Generally it means loan limitation and stricter credit assessment criteria. Though some observers link such refinancing issues to higher possibility of default risks closer to the 2017 deadline, banks say it is far-fetched to presume so, as the connection is tenuous. According to MAS, the percentage of borrowers that currently breach TDSR limits is not high. [Singapore] A few good conversational pieces can make social lunches entertaining if not worthwhile. The hot topic is of course property. Depending on who you talk to, there is always a different angle to a given topic. OK, let's open up the topic a little wider to add more perspective and entertainment. Norway Is Tycoon Next Target | 'take my money', it needs a home. After his US$200 million resort and mountain park buying adventure in Iceland has been blocked, China property tycoon's dollars is screaming all the way to Norway for attention. Malaysia has bulk buying investment clubs to gain an edge in discounts and smaller down payments. These days, some people evolve strategies to game the system. It is the norm and the theme of 'making your money work harder, smarter and come out of it a little better' has no expiry date. As far as housing goes, the new refrain making its rounds everywhere in sales pitches is 'affordable'. There is no doubt about that. 'Look, my house just shrunk. Of course it has to be affordable. How else can I buy'. There was a time when the authorities came out to say it is not building 2-room HDB flat any more, as public expectations have changed. Given a few short years, how quickly this position has reversed. And now smaller and smaller homes seem to be the in thing. Japan and Hong Kong type housing, anyone? So when we hear a little public hollering, the hue and cry just goes to tell 'the policy' is hitting its mark and that goes for housing too. A new refrain from industry circle has just begun which is another way of saying that the pain inflicted on the property market is starting to tell. With the property sector almost strait-jacketed, a property developer has metaphorised the residential property market to a stringed-up crab with all eight legs strung tight. No way to move, so to speak. Seven rounds of cooling measure and one TDSR leaves little room for the property market to manoeuvre. Though the TDSR, or total debt servicing ratio, is not represented as a property cooling measure, it is by far the most effective instrument in curbing momentum. TDSR requires banks to thoroughly compute into account a borrower's total debt obligations which is set at a maximum of 60 per cent of a buyer's gross monthly income, before a new home loan can be granted. Total debt includes other mortgages and car loans as part of the deal. The combined weight of a string of cooling measures which include a lower loan-to-value ratio, shorter loan term, additional buyer's stamp duty (ABSD) and seller's stamp duty (SSD) and the TDSR framework have finally succeeded to stall the residential market dead in its tracks, said industry analysts. The measures have curtailed transaction volumes significantly and led to a moderation in home prices. Prior to the implementation of the TDSR, buying sentiment for private homes in particular were fleetingly cautious, only to move on in a frenzy, until the next successive cooling measure came along. What is noticeable were short intervals of up and down adjustments in transaction volumes, with the lull coming immediately after each introduction and the upswing after developers introduced counter moves to offset the effect, in new launches. However, ever since the TDSR framework was introduced on 29 June 2013, new home sales are down drastically across the board, including those in the mass market segment taking a major hit. Observed the TDSR effect before and after its implemention. Before the measures, developers shifted 9,950 private homes in the first half of 2013. With the entire residential market affected, responses from industry leaders are coming in thick and fast. Respected helmers in the banking and property industry have taken it upon themselves to speak out for the property sector and call for an easing of the cooling measures. On the sidelines of the Real Estate Developers' Association of Singapore (Redas) Spring Festival lunch two weeks back, City Developments executive chairman Kwek Leng Beng suggested that the time may be ripe for the Government to mull over the lifting or tweaking of some of the cooling measures, in the light of concerns over the global economy. DBS Bank chief executive Piyush Gupta predicted last week that home prices this year would fall by 10 to 15 per cent. Shrinking volumes and price moderations, just when these measures are starting to bite will not prompt the Government to roll back the cooling measures at this point in time. The truth is a ­gradual deflation in prices may well be what the doctor ordered. In fact the government may just have resolved one of the sticky issues most disgruntled Singaporeans have over high property prices and unaffordability issues. The fall in private home prices has been small and shallow as Urban Redevelopment Authority data shows, dipping a mere 0.9 per cent in the fourth quarter of last year. This was the first time that overall prices had fallen since the first quarter of 2012. But look again, see this graph. Jan 2014, the average price has moved back up ever so slightly. Although there is some merit in calls for a scaling down of the cooling measures, the latest numbers just show that it is still early days to make any rational move. Latest news portray good class bungalow market making a comeback and limited office spaces likely to boost rents this quarter. Additionally, key drivers fuelling the property buying spree - like high liquidity, low unemployment, low interest rates, inflationary pressure and rising income among the more affluent - have not abated. So while some developers are hurting, the evidence does not support an imminent lifting of cooling measures. Some analysts are concerned with a looming massive supply of public and private homes. From 2014 to 2016, more than 97,000 new Housing Board flats will be completed. The private home segment, including executive condo will contribute another 77,000 units. "It is not going to be easy calibrating the property market for a soft landing because the real estate market is imperfect on both the supply and demand side," said Savills research head Alan Cheong. "The best one can do is to ensure that the macro variables like interest rates and policies are not either overly restrictive or loose. Within that framework, the Government should accept some degree of volatility." The general concensus is that a 10% drop in prices over the next 12 months is generally accepted as not too excessive, given the run-up over the past five years. The simmering issue of public housing has been significantly addressed by the housing authorities ramping up the supply of Build- To-Order flats to meet demand of first-time buyers at subsidised and ‘affordable’ prices, alongside with its various housing schemes introduced to make public housing even more available to a wider scope of buyers. The ‘3 Generation flats in Yishun’ initiative and the ‘Parenthood Priority Scheme’ & ‘Parenthood Provisional Housing Scheme’ were public housing policies to support social objectives. 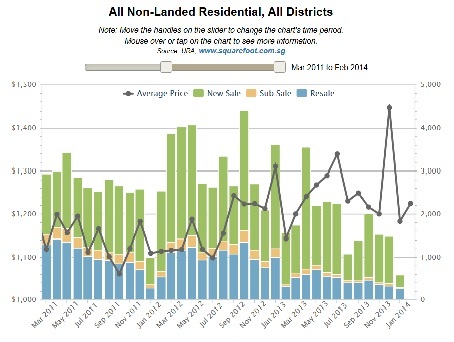 Industry watchers believe that the Additional Buyer Stamp Duty (ABSD) and Seller Stamp Duty (SSD) have somewhat achieved their objectives of keeping over-exuberant property investors and speculators at bay. In fact it doesn’t pay to speculate these days, with runaway home prices, property supply overhang and a potential upward revision in interest on borrowings. The punitive seller’s stamp duty with rates of up to 16 per cent imposed on home owners who resell their property within four years have effectively driven speculators out of the market. Will the authorities loosen up on restrictions? All will be likely done in due course, as the market equilibrates itself. However managing the property market is not an exact science because property is very much sentiment driven. When there is a crowd, everybody wants in. When no one is buying, nobody wants to make the first move. This is where sales campaigns all over the world use sentiment-driven concepts to drive sales. Weave a yarn and form a web-cobbled trap. Watch your steps or be blithefully entrapped. 1. The Monetary Authority of Singapore (MAS) has received feedback from borrowers who face challenges refinancing loans for owner-occupied properties which were bought before the introduction of the Total Debt Servicing Ratio (TDSR) rules. MAS has decided to broaden the existing exemption from the TDSR threshold of 60 per cent for such loans to ease the debt servicing burden of these borrowers. 2. Under the revised rules, a borrower who bought a residential property before the TDSR rules were introduced – i.e. the Option to Purchase (OTP) of the residential property was granted before 29 June 2013 – will be exempted from the TDSR threshold as long as he occupies the residential property that is being refinanced. This is a concession compared to the current rules, which also require that he does not own any other property, or have any other outstanding property loan. 3. The Mortgage Servicing Ratio (MSR) will also not apply to the refinancing of loans for HDB flats and Executive Condominiums (ECs) that are owner-occupied and were purchased before their respective MSR implementation dates. 4. A similar concession will apply with regard to loan tenures, for residential properties purchased before the respective implementation dates for the loan tenure limits. In such cases, borrowers whose loan tenures for their owner-occupied residential properties exceed the current regulatory limits will be allowed to maintain the remaining tenures of their loans at the point of refinancing. 1. Financial institutions will be required to obtain documentary evidence to verify that the OTP was granted prior to 29 June 2013 and that the borrower occupies the property. 2. The OTP was granted before 12 January 2013 for HDB flats and 10 December 2013 for ECs purchased directly from a property developer. 3. Where the OTP was granted before 28 August 2013 for HDB flats and 6 October 2012 for other residential properties. 4. 30 years for HDB flats and 35 years for other residential properties. 5. The TDSR threshold of 60 per cent will continue to apply to the refinancing of all investment property loans. This is to encourage borrowers to right-size their loans and thereby reduce their vulnerability to adverse economic conditions or changes in interest rates. However, MAS recognises that some borrowers may face challenges in right-sizing their debt obligations in the short term; the starting level of debt may be too high and there may be significant costs involved if they had to sell their properties to reduce their leverage. (c) the borrower fulfils the Financial Institution’s credit assessment. 7. The changes are intended to help borrowers ease their immediate debt servicing burdens, while encouraging those who have taken on high leverage on their investment properties to right-size their loans as early as possible. 8. Borrowers should be aware that the current low interest rate environment will not persist indefinitely. When interest rates rise, borrower s will face higher mortgage repayments. Borrowers engaging in refinancing should therefore exercise prudence and review their debt commitments. 9. The revised rules will take immediate effect.